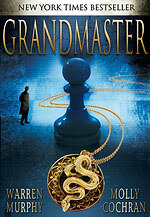 From New York Times bestselling authors Molly Cochran and Warren Murphy, Grandmaster is a Mystery Writers of America Edgar®-award-winning thriller spanning the globe from Moscow to Washington, Havana to Tibet. Born thousands of miles apart under the magical sign of the gold coiled serpent, Justin Gilead and Alexander Zharkov are destined to fight one another throughout their lives in a quest for ultimate power. As young boys, rooks and pawns were their weapons of choice. Decades later, they employ far more dangerous means of destruction. Justin has become a master spy; Alexander, the ruthless head of a secret agency. Each is the possessor of an extraordinary intellect and legendary skills. Their paths will cross once more as they fight together against a terrifying evil. But ultimately they must fight to destroy the other. There can only be one Grandmaster.